The Miniature Guide to Critical Thinking Concepts and Tools, a resource that briefly introduces teachers to the critical thinking concepts and theory they need to effectively teach children to improve their thinking and learning. One copy of The Miniature Guide to Critical Thinking for Children. 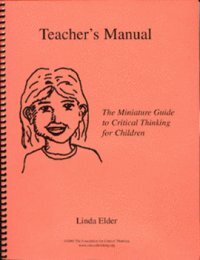 Suggestions for using The Miniature Guide to Critical Thinking for Children and teaching basic critical thinking concepts. “Think for Yourself” (TFY) activities for children which help them internalize critical thinking concepts. If your children are at the k–2 level or have reading difficulties, you can use the exercises as idea generators for verbally teaching the concepts. 541M Teacher’s Manual for 540M (children’s mini-guide) $12.45	 Qty. All of the ideas in this manual have been used with elementary students. Ideally children will have their own copy of The Miniature Guide to Critical Thinking for Children. As you use this mini-guide on a daily basis in your classes, children will begin to internalize critical thinking concepts and develop their reasoning abilities. Included in the Teacher’s Manual are strategies for using the masks of Fairminded Fran, Naïve Nancy, and Selfish Sam. These characters can be used in helping children distinguish between skilled and unskilled thinking, as well as fair and unfair thinking. TFY #3: When Are You Fair? When Are You Unfair?